The FDR Memorial is part of the National Mall and Memorial Parks of Washington, D.C. Open 24 hours a day, the memorial chronicles the four-term presidency of the 32nd President, Franklin Delano Roosevelt, through bronze statues, water features, and walls carved with his most memorable quotes. The memorial occupies 7 acres at the edge of the Tidal Basin in the park, surrounded by the Japanese Gardens, alongside neighboring memorials for Dr. Martin Luther King Jr and Thomas Jefferson. The unique design of the memorial walks visitors through four different “rooms,” each room representing one term of Roosevelt’s four-term presidency. The rooms are arranged in chronological order, but visitors are meant to wander through, stop and start at any point, and exit at any point. 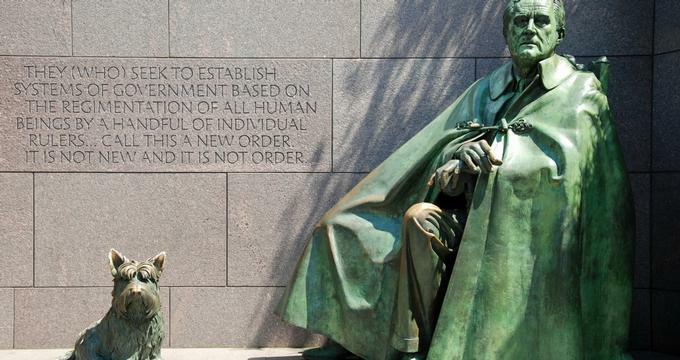 In each of the sections, one finds water features, quotes carved into the stone façades, and bronze statues; each representative of the particular presidential term. In the room representing Roosevelt’s third term, the chaos of the water falling at varying angles signifies the beginning of World War II. A large bronze sculpture shows FDR seated alongside his dog Fala, the only dog to be memorialized on the National Mall. A cloak covers Roosevelt’s chair, a controversial representation since it hides the wheelchair he was confined to after suffering from polio. The final section of the memorial includes a bronze relief of the president’s funeral procession. A still pool of water represents is death. Here, visitors find a bronze stature of First Lady Eleanor Roosevelt, which honors her dedication to the United Nations. This is the only presidential memorial to depict a First Lady. History: The 1974 design competition for the Roosevelt memorial was won by architect Lawrence Halprin; however, it would take more than 20 years for Congress to appropriate the funds for its construction. The FDR Memorial was at last dedicated in 1997 by then-president Bill Clinton. It was the first wheelchair-accessible memorial to be built on the National Mall, in consideration of FDR’s own disability, having been relegated to a wheelchair due to polio in 1920. Although the original memorial made great efforts to be accessible for those with physical disabilities, the avoidance of representing the president’s wheelchair brought great controversy. In 1999, The National Organization on Disability raised almost two million dollars to fund the addition of another statue that would clearly show the president in a wheelchair. In January 2001, the additional statue was placed in a new “prologue room” near the memorial entrance. The controversy continues to this day, as there are several who claim that Roosevelt himself made great efforts to hide his disability from the public during his presidency. Ongoing Programs & Education: The National Parks Service offers programming throughout the year at several of the sites throughout the park. Ranger talks and guided tours give visitors insight into the history represented at each memorial. Tours are free to the public. Visit the calendar of events on the National Park website to see if there are scheduled programs related to the FDR Memorial. Visitors should be aware that this memorial is entirely outdoors. What’s Nearby: Visitors to the National Mall and Memorial Parks may be interested in spending more time at the nearby memorials, which include the Washington Monument, the World War II Memorial, and the Lincoln Memorial. Memorials nearby which surround the Tidal Basin include the Thomas Jefferson Memorial and the Martin Luther King Jr Memorial.